Connecticut’s rocky shoreline and its many treacherous ledges and islands in Fisher’s Island Sound and Long Island Sound, constantly kept mariners on the alert, claiming the lives of many during New England’s fierce storms. 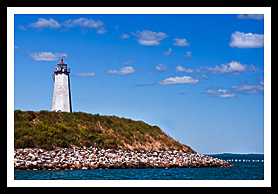 Lighthouses were built here to guide shipping traffic from the fishing and whaling industries into the busy commercial port of New Haven, and around a dangerous rock formation about a mile offshore entering New Haven Harbor called Southwest Ledge. They were also built to guide ships coming through Long Island Sound where the Connecticut River empties into the sound at Old Saybrook often shrouded in fog, and around dangerous Faulkner’s Island. Note: The lighthouses mentioned below that you can drive to may also be viewed from various boat tours offered, see Boat Tours below. 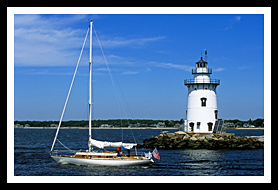 Of all of Connecticut's 20 lighthouses, fifteen Lighthouses are best viewed closely by boat, or ferry, leaving only five Lighthouses easily accessible to visit for close views by land. Many attractions in New Haven have to do with connections to Yale University, helping New Haven to become the cultural center it is today. There are all kinds of performances and exhibits in the arts and theater, and many forms of music. You’ll also find the Yale Bowl for college football. There are museums of natural history and New Haven history, architecture from the nineteenth century, and many specialty shops. In New Haven, the Peabody Museum of Natural History offers thousands of exhibits about our earth from dinosaur fossils to saber-toothed tigers. For those of us who are young or young at heart, and enjoy PEZ candy from a variety of special unique and personal dispensers, visit the PEZ Visitor Center in Orange, just outside of West Haven. If you go there during business hours you may be able to view the factory to learn how this candy has been made for over 80 years. Heading eastward along interstate Route I-95, or Route 1, most attractions are easily accessed from either of these routes. Five Mile Point Light guards the entrance to New Haven, five miles away. Lighthouse Point Park, where you can walk up to Five Mile Point lighthouse, and get a distant view of Southwest Ledge light, is one of the many parks New Haven has to offer. For family fun in Middlebury, visit the Quassy Amusement Park. Guilford offers five differing museums for visitors to explore while they're in town. 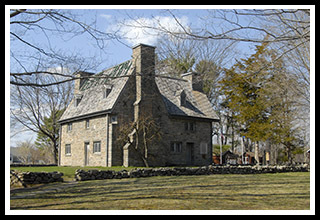 One of them, the Henry Whitfield State Museum, provides visitors a glimpse into Connecticut's oldest historic stone house. For those who enjoy hiking, the WestWoods and Timberlands Trails System offers nearly 40 miles of trails through caves, waterfalls, marshland, and naturally carved rock formations. Old Saybrook is one of the oldest towns in Connecticut. It offers plenty of community events and historical New England 19th century Victorian architecture. There are more 18th century Colonial and 19th century Federal buildings than you will find in most New England towns. To get around town, you can take the Old Saybrook trolley. Fort Saybrook Monument Park is the first military fortification in Connecticut. 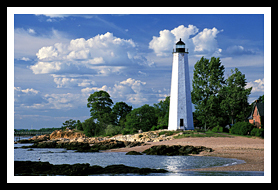 You can find nice views of Lynde Point Light (private residence), which you can observe a few hundred yards away on shore and also get some good distant views of Saybrook Breakwater Light nearby. Boat cruises mentioned below offer many types of cruises. While some may offer specific lighthouse cruises, some will pass by specific lighthouses as part of charters, narrated wildlife and historic tours, fishing tours, and other types of excursions. 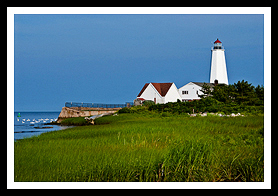 In the early fall, there is an annual open house for the public to explore the grounds and lighthouse. 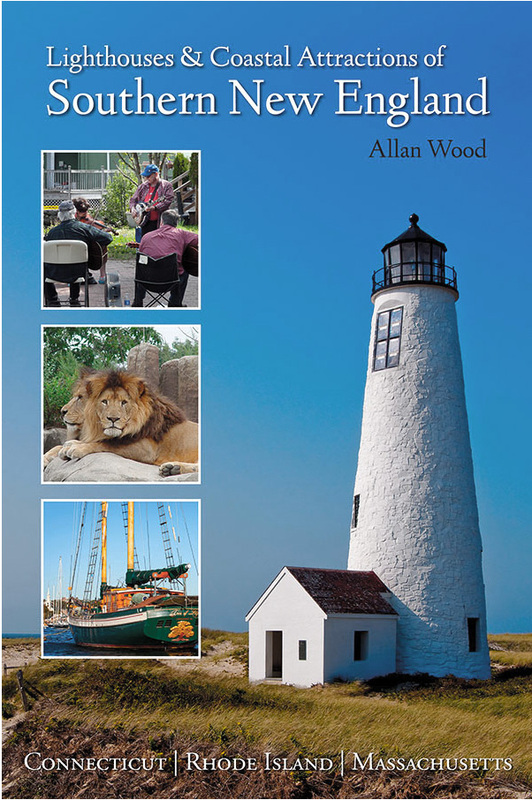 My new book, Lighthouses and Coastal Attractions of Southern New England: Connecticut, Rhode Island, and Massachusetts, provides lots of special human interest stories from each of the 92 lighthouses in these states, along with plenty of additional indoor and outdoor coastal attractions and tours in the area, with contact info to plan your trip. I'll be happy to sign it for you here, or you'll find it in any fine bookstore.